The Writing Bird is a pen or pencil holder designed for persons with limited hand coordination or dexterity, arthritis, neurological disabilities, and weak thumb to fingertip pinch. This writing aid requires using an arm to shoulder motion rather than wrist movement with the fingers in any position, and is used by sliding the unit over the paper. The device comes with a retractable pen held in place at the top of the unit. The device may benefit individuals who need to learn to write with the non-dominant hand or to relieve stress on arthritic joints. 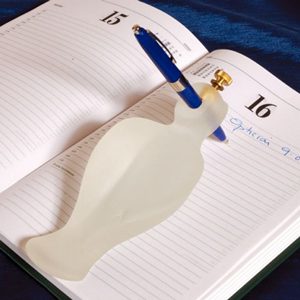 The Writing Bird is made of frosted acrylic. Manufacturer: North Coast Medical, Inc.